VisualCAM for SOLIDWORKS® is based on our industry leading VisualCAM software that is fully integrated in SOLIDWORKS 2011 thru 2019. From simple 2-1/2 axis to full 5-axis continuous milling, VisualCAM for SOLIDWORKS will help you make parts, fast. VisualCAM 2019 for SOLIDWORKS also an add-on TURN module. This family of products offers several options to fit your machining needs and are fully integrated with SOLIDWORKS, offering an intuitive combined user interface for CAD and CAM, fully associative toolpath updates, and a wide variety of post processors. Compared to a stand-alone CAM system, VisualCAM for SOLIDWORKS will save you countless hours by automatically updating toolpaths when your model changes. 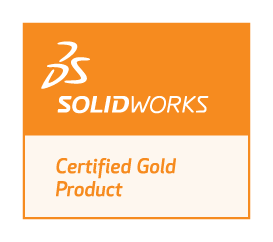 And being integrated with SOLIDWORKS means you only have one interface to learn, saving even more valuable time. This fully associative parametric CAD/CAM system makes VisualCAM for SOLIDWORKS one of the most cost effective and powerful systems in the market today.